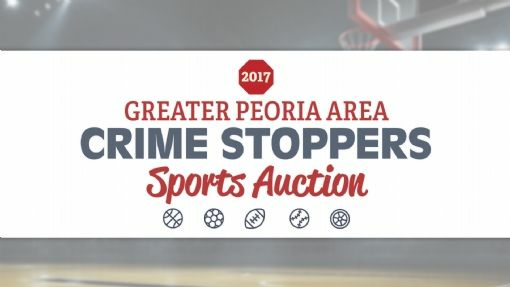 The Greater Peoria Area Crime Stoppers will be hosting their 13th annual Sports Memorabilia Auction on Friday, July 20th from 6:30pm to 9:30pm. The event will be held at the Par-A-Dice Hotel located at 21 Blackjack Blvd. East Peoria, IL. The auction acts as the main fundraiser for the Crime Stoppers program, which is committed to serving our communities by supporting neighborhood safety. Admission is a suggested donation of $50. For more information regarding the auction event, please contact Don Gustin at don1@awardsnow.com. Crime Stoppers is funded solely by private donations, fundraising, and fine monies, rather than relying on tax dollars. Rewards paid out in successful arrests, advertising, and the 24 hour call center are dependent on local businesses and concerned citizens like you. The Greater Peoria Area Crime Stoppers are actively seeking donations and sponsorships for their continued operations. Please consider supporting your local Crime Stoppers to keep our neighborhoods safe. Bronze ($250): Bronze Sponsors receive a spot in the rotating banner on the Crime Stoppers website to be displayed throughout the year. Silver ($500): Silver sponsors receive two rotating banner ads on the Crime Stoppers website, and a listing on the Sponsorship page. Gold ($1000): Receive three rotating banner ad placements and near top listing on the sponsorship page of the Crime Stoppers website with all your business information, including links to your own website. Platinum ($2500): Stand above the rest with top listing on the sponsorship page at peoriaareacrimestoppers.com, in addition to four rotating banner ads. Personal Donations: Individuals making smaller donations will also be listed on our site. Donations of all and any size are greatly appreciated. Announced today, Peoria Crimestoppers will pay a cash award of $5,000 for information that leads to the arrest and charging of a suspect in homicides by gunfire. The previous award was $1,000. Law enforcement sees this is a big boost. "This is just a huge opportunity by raising this amount of money to allow us to do our job. And i think this is just going to be a tremendous asset," said Peoria County Sheriff Mike McCoy. "We do need that help in getting some of these cases solved. We have a large number of cases that, violent cases, that need some assistance. And we're hopeful that these new measures will increase that participation," said Peoria Police Chief Jerry Mitchell. Crimestoppers scrubs and deletes all emails, phone calls and texts once a tip proves successful.